Working-class Americans have had enough of trade policies that accelerate the race to the bottom. In a Friday night showdown at the Democratic Party platform-drafting committee, the Clinton majority outvoted the Sanders delegates 10-5, rejecting any language specifically opposing the Trans-Pacific Partnership. Instead, the majority substituted generic language that trade deals should protect workers’ rights and the environment, and a misleading sentence that claimed that Democrats are divided on trade. 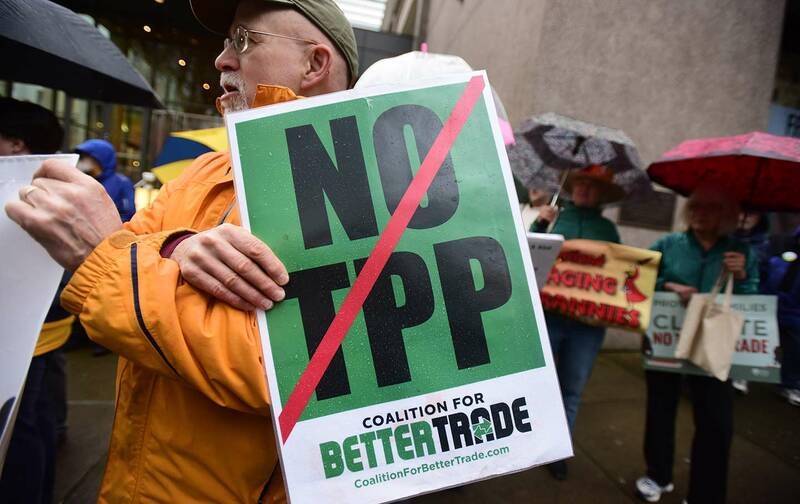 A year ago, 85 percent of House Democrats voted against a fast track on the TPP. Both Presidents Clinton and Obama have maintained that their deals, from NAFTA to the TPP, had better language on the environment and workers’ rights than any previous trade agreement. The issue, of course, is that not a single agreement has provided anything meaningful for workers or preventing climate change or protecting consumers. The language may be better, but it is virtually unenforceable, especially compared to the reparations multinational corporations receive through their right to sue in private tribunals known as investor-state dispute settlement. Last fall, as Bernie Sanders made opposition to the TPP one of the major issues in the campaign, Hillary Clinton switched her position to opposing the TPP. When Clinton was secretary of state, she and her staff played a major role in outlining an agreement and picking new trade partners—Vietnam, Brunei, Malaysia, and Singapore. Foreign-policy arguments, then and now, were at the center of the pro-TPP argument. Both Obama and Clinton argued that a trade deal would move those four nations closer to the United States and away from China. Most importantly, once adopted, the TPP can never be reversed or amended without the agreement of all 12 nations. President Obama continues to lead with this foreign-policy argument as he prepares to send the TPP to Congress for a lame-duck vote after the election. Amazingly, despite opposition from virtually every environmental, consumer, immigrant-rights, and labor organization, the president has made it clear that he will do everything possible to pass the TPP, with the support of Republicans in Congress. Now, Clinton Democrats are preparing to make passing the TPP even easier, despite the net loss of jobs and the permanent harm to the environment that will almost certainly result from it. Most importantly, once adopted, the TPP can never be reversed or amended without the agreement of all 12 nations. How can President Obama claim that American workers can compete with anyone in the world, while at the same time handcuffing them to a race to the bottom? How can he go to Paris and talk about greenhouse-gas reduction and then in the TPP provide fossil-fuel companies with the right to sue if any of the partner nations increase regulations that threaten their future profits? Just days ago, Trans Canada sued the US for $15 billion, based on NAFTA provisions, arguing that the United States was in violation of the rules and now owed it for future lost profits. The Clinton campaign is well aware of these arguments. In fact, Paul Booth, a member of the drafting committee appointed by Clinton, is also a top staffer at AFSCME, the large public-sector union that has opposed the TPP. But President Obama has objected to any language opposing TPP in the platform, and the White House aggressively lobbied drafting committee members to reject an anti-TPP plank. In the end, even progressive Representative Barbara Lee, who opposes TPP, joined the nine other Clinton and DNC appointed committee members to prevent meaningful inclusion of opposition to TPP in the platform. The draft platform must now go to the full committee meeting in Orlando on July 8 and 9. The dispute over the TPP and other issues—like support for the $15-an-hour minimum wage, opposition to fracking, support for a carbon tax, and a more balanced Middle East strategy—will be hotly debated. Afterwards, the Sanders team will decide which issues to push to a floor fight at the convention. Policy disputes are to be expected. There are many positive policy positions in the draft platform, and Sanders supporters should be encouraged by provisions on financial regulation, voting rights, and native American rights, among other items. However, the Clinton campaign’s reversal on the TPP is not just bad policy—it’s terrible politics. Donald Trump has argued that Hillary Clinton would sign the TPP, which would cost millions of American jobs. Working-class Americans have had enough of Democratic presidents like Clinton and Obama saying one thing to get elected, and then adopting trade policies that accelerate the race to the bottom. The Brexit vote in the UK was, in part, about working-class disgust with the rigged global economic system that places investment interests far above their own jobs and living standards. One positive result is that there is much more attention to the evils of the TPP and growing pressure on the White House to not send it to Congress. Stopping the TPP will require massive resistance far beyond the Democratic convention. For Bernie supporters, and hopefully millions of others, the alarm has been sounded. We are waking up, standing up, and fighting back. Corrected on June 30, 2016: The original article misattributed a statement about Democrats voting against a plank opposing TPP out of deference to President Obama to Representative Barbara Lee. Larry CohenLarry Cohen is a senior advisor to Bernie Sanders, past president of the Communications Workers of America, and a member of the Democratic National Committee.